This beautiful atlas conveys not only the practical knowledge of dental anatomy but also the art of sculpting it in wax. The ideal anatomy of each dental structure is described in detail and the waxing techniques are beautifully illustrated step by step for visual reference. The author demonstrates that for every morphologic feature there is an explanation in nature, assigning significance to every minute feature of dental morphology. 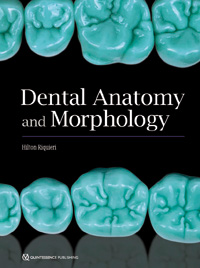 Organized by tooth and arch, this book views morphology through a clinical lens and repeatedly draws connections between anatomical features and clinical concepts. The fundamental knowledge presented in this text is essential for improving waxing and sculpting techniques and will be useful for students and specialists alike. Fabrication of posterior prosthetic teeth is an art that requires technicians to reproduce the minute details of occlusal form using difficult methods of wax-up. Written for students as well as experienced clinicians, this landmark book will change the way that technicians wax up teeth.